Revd John Kilpatrick, senior pastor of Church of His Presence, Daphne, Alabama, whom the Lord blessed as host of the Brownsville Revival (1995) in Pensacola, Florida, and Bay of the Holy Spirit Revival (2010) in Mobile, Alabama. URGENT WORD FOR AMERICA CONCERNING BOTH REPUBLICANS AND DEMOCRATS…! A WORD TO ALL THE ELEPHANTS (REPUBLICANS), “WATCH! 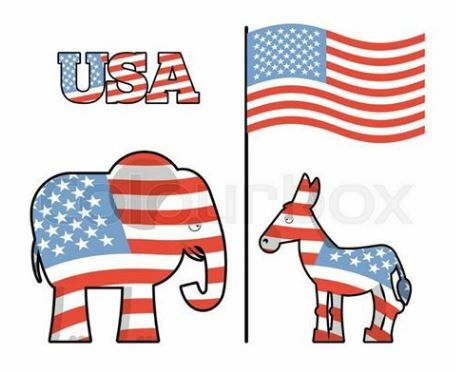 FOR A SUPERNATURAL ACCELERATION IS COMING UPON THE REPUBLICAN PARTY, THEY WILL BECOME UNSTOPPABLE AND UNCONTAINABLE, THERE WILL BE AN EVEN GREATER SHAKE-UP, BOTH POLITICALLY AND SPIRITUALLY, TAKING PLACE OVER THE LAND; WATCH AND PRAY! FOR THERE WILL BE A BREAKING OF THE BACKS OF MANY DONKEYS (DEMOCRATS) IN THE DAYS AHEAD, THEIR CRIES WILL GO UNHEARD FOR GOD HAS HARDENED THE HEARTS OF THEIR TASK MASTERS…! “WATCH! FOR WHAT I AM ABOUT TO DO IN THIS NATION WILL BE UNSTOPPABLE AND UNCONTAINABLE, FOR THERE IS NOW COMING AN EVEN GREATER SHAKING BOTH SPIRITUALLY AND POLITICALLY TO THIS NATION, WATCH! FOR MY HAND OF RIGHTEOUSNESS AND JUSTICE IS NOW MOVING TO SHAKE, SHIFT AND SIFT THIS NATION”! LISTEN, WATCH AND PRAY; “Whoever remains stiff-necked after many rebukes will suddenly be destroyed–without remedy. When the righteous thrive, the people rejoice; when the wicked rule, the people groan”! Let us PRAY; FOR THE GOVERNMENT AND THE CHURCH IN THIS HOUR, LET’S SEEK GOD’S FACE FOR WISDOM, UNDERSTANDING, KNOWLEDGE, STRENGTH, POWER, COUNSEL AND THE FEAR OF THE LORD. PS; PLEASE PRAY AND WEIGH AND SHARE AS THE SPIRIT LEADS. (The Lord said), “Tell the people that the middle-ground has now disappeared! It’s either going to be evil or it’s going to be Godly! I trust this post’s content and my insertion of dates indicates why I consider it and the related recent postings as being ‘God’s Global Prophecy Signals’. 24 They see the works of the Lord, and His wonders in the deep. 25 For He commands and raises the stormy wind, which lifts up the waves of the sea. 26 They mount up to the heavens, they go down again to the depths; their soul melts because of trouble. ‘In addition, the sudden increase in tsunami alerts issued by the U.S. Tsunami Warning Center has been noticeable. 21 alerts came into my inbox over the last month in comparison to just one alert in the previous four months, which stemmed from much seismic activity in the last month. ‘However, in light of Veronika West’s prophetic word entitled Urgent warning for the world [12th Sept] that arrived in my inbox yesterday via Richard’s Watch, I sensed a pressing need to forward Des’ word. Being away from my desk as usual over Friday-Sunday 14-16th and having scheduled items relating to my ‘spiritual birthday’ I did, however, catch brief sight of Ben’s stirring communication and attachment on my phone. So I printed off hardcopies to read and mull over the weekend, which is when the Cat 4 Florence hit USA. Its controlling high pressure system effectively ‘debunked climatology’, thus indicating it’s a God-thing! So I noticed the references to mighty meteorological and geophysical global events with resultant flooding and chaos in what I was reading from Des Branagh. Then on Sunday 16th along came Veronika West’s account of having seen a sharp, sickle-shape fly across America. 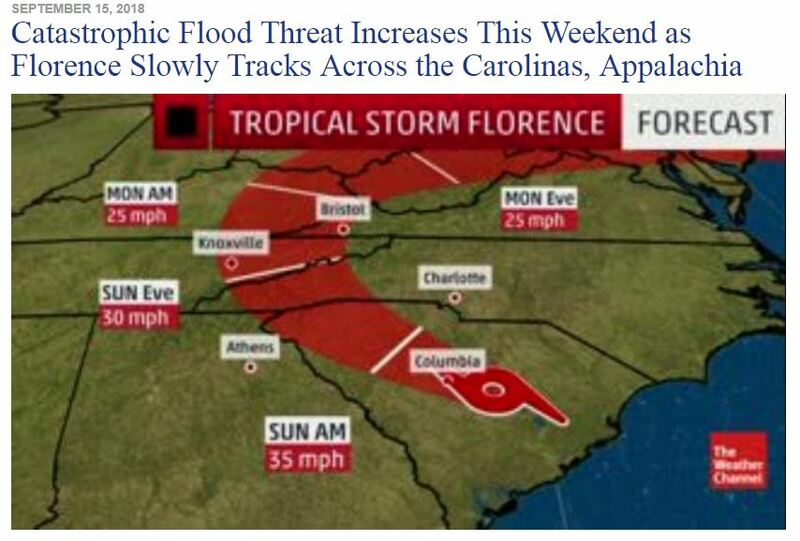 I noted it’s just like the unexpected overland track of hurricane Florence, as illustrated in the first part of my record-breaking post Prophecies of the Spiritual Significance of Hurricanes Striking the USA. This prophetic word closes: “WATCH AS THE SHARP SICKLE OF MY JUSTICE AND JUDGEMENT NOW FLIES FORTH ACROSS THE NATION OF AMERICA”. “THE WHIRLWINDS OF MY SPIRIT WILL GATHER THE WHEAT AND SCATTER THE TARES, THE WHIRLWINDS OF MY SPIRIT WILL CAUSE A GREAT SHAKING, SIFTING AND SHIFTING TO TAKE PLACE IN THE NATIONS, WATCH! FOR A DIVINE DISRUPTION HAS NOW BEEN RELEASED UPON THE NATIONS”! To conclude, we therefore notice several dates over the course of three weeks on which servants of the Lord bring or convey similar words relating to a great global shaking by means of upheavals as a result of humanity’s unrighteousness, and thus urging us to repent and prepare for the return of the King of Kings! ‘This is a Year of Divine Interruptions’ and ‘Final Word’, respectively the opening and closing of twenty-one words delivered Friday 19th January deal with the global scene specifically. We heard these words after I’d finished drafting the previous post on my insights gained a fortnight ago on Zecharia 2. Revd John Kilpatrick brings what the Lord told him after waking him on 23rd December 2017 and four minutes into this message he refers to the issues over Jerusalem and Israel that I’ve blogged about. I humbly submit that the above verses about defending Jerusalem may be relevant to the unending influx of millions of Muslim refugees into Europe, as well as to Britain’s leaving the European Union – even to the EU’s grossly hypocritical failure to apply an international law! Could this be the real reason behind our getting out of the EU? When using the above verses to open the first part of this Zecharia 2 Update (on EU Supports Palestine Against Israel) I was going to refer to the original Hebrew. However, the website wouldn’t open and so I opened my NKJV Study Bible but got nudged for some reason to grab the classic edition of the Amplified Bible from my bookshelf. During the course of drawing attention to European hostility towards Israel, I noticed this Bible’s verse 9 hints at a very subtle nuance: one that may explain the consequences upon Europe of the EU’s policy! Chapter 2 covers the third vision prophet Zecharia received, which is of the measuring and rebuilding of Jerusalem and of the Temple. Although set in the decline of the Babylonian Empire it foreshadows the eschatalogical New Jerusalem. YET I WAS STRUCK THAT IT MAY APPLY TODAY TOO! Historically, verse 9 describes the Lord’s retribution upon the Babylonians, yet it could also promise that happening any time in the future. BUT AHA! – it’s already been happening!! That is, the consequences of EU hostility are already ongoing, or have been so for at least the past couple of years in the massive migration of refugees into Europe! My quick reading of that short text led me to colour it to distinguish between what I thought is the writer’s narrative (v.8) and the Lord’s words (v.9), but later I learned that translation of v.8 is difficult. The New Bible Commentary’s opinion is ‘The speaker is the Messiah, who is sent to the Jews, to whom pertains the glory (cf Rom 9:4) to be their Protector…(repetition of) ‘sent me’ emphasises the importance of the commission…to protect His own from all hostile powers that menace this precious possession. Others, however, think that the pronoun refers to the enemies of Israel and means that they endanger their own safety by hostility towards the elect‘ (emphases mine). In fact, both option could now be in play: ie. not only to protect His own from all hostile powers menacing His people but also to act specifically against them! Historically, the colonial empires of Britain, France, Spain, Germany, Italy and Holland had taken control of lands across Africa, Asia and the Middle-East and used their populations as a source of labour, servants and military personnel. Verse 9 clearly implies that such servants of European colonial empires will come and ‘plunder’ those empires, either there or back on home territory, as a Divine directive. Why? Because they’ve ‘touched the apple of His eye’ – His Jewish people and His holy city – Jerusalem! That is, nations which permit their citizens to insult and denigrate the Jewish people and their state – and making others boycott Israeli goods and services! – would eventually find that the Lord’s declared intention gets applied in their own lands, which is what we’ve been seeing before our very eyes. And this is despite many European nations subscribing to the Laws of Holocaust Denial. As mentioned in the previous Update, not only the Palestinian leadership but also that of the European Union refuse to recognise and stand resolutely against the Word of God. On his December visit to Europe Israel’s PM Netanyahu encouraged its leaders to be open to Donald Trump’s recognising the reality of Jerusalem being Israel’s capital, but Europe’s foreign policy chief rejected his plea outright. That’s hardly surprising in view of the EU’s parliament building in Strasbourg being specifically built like the Tower of Babel, as described in UK/EU in/out #2 cont’d – Significant Spiritual Signs. ‘Palestinian Authority President Mahmoud Abbas on Monday urged the member states of the European Union to “swiftly” recognize the state of Palestine, arguing such a move would preserve the Palestinians’ hope for peace. “We truly consider the European Union as a true partner and friend, and therefore we call its member states to swiftly recognize the state of Palestine and we confirm that there is no contradiction between recognition and the resumption of negotiations,” Abbas said in an address in Brussels. Why is the EU warmly welcoming this rabid racist and Holocaust denier? He should have been arrested as soon as he set foot in Europe! ‘Israeli President Reuven Rivlin said that Abbas’ remarks (in Cairo at PLO conference on 19th January) harken back to “things that led him to be accused years ago of anti-Semitism and Holocaust denial.” Abbas’ PhD. thesis, which he wrote for a Soviet university controlled by the KGB in the 1960s denied the Holocaust. ‘Contrary to Rivlin’s view of Abbas racist assault on Jews as a throwback to an earlier time, antisemitic diatribes have been a consistent feature of Abbas’ public statements, whether he is speaking to Arab or Western audiences. ‘In a speech before the European Parliament in 2016, for instance, Abbas recycled the medieval blood libel that Jews poison the wells of Christians. That blood libel incited the death of thousands of Jews through the ages. BREXIT – OUR ‘GET-OUT-OF-JAIL’ CARD! “Rather than rely on Me and my faithfulness to you, you chose, for worldly purposes, to join yourself to an institution which has denied my Name and refused to acknowledge Me in its councils. My fierce anger is upon that institution on account of its rebellion, its defiant rejection of me and its hardness of heart towards my ancient people Israel. “I warn you now that the European institution will not repent, even though I bring disaster and destruction upon it. I urge you, O Britain still beloved by Me for the sake of your godly forefathers, come out of her, so that you may not be caught up in that same destruction, for I am even now arising in judgment to bring to nothing what she has sought to achieve. If you will separate yourself from her declared rejection of God, I will have mercy upon you and restore my hand of protection; and I will use you once again to bring light to many lost in the darkness which is now steadily increasing. Thus, the Lord’s deep desire is for the UK to avoid the judgement He’s already bringing upon the EU (latest at Davos 2018 re France and Ireland on Brexit deal). Several readers have commented or emailed me on the timeliness of the word from Liz Evans in her Call to pray for our nation and establish God’s rule. It is undated and thereby avoids attribution of dating or thinking its ‘dated’, or it’s gone stale. After all, the Lord looks over His word to ensure it achieves its purpose and thus doesn’t return to Him void (Isaiah 55:11). This word brought by Liz was received several years ago, but we’ll connect the ‘prophetic dots’ or ‘jigsaw pieces’ and examine them as being evidence from the Lord as to that word being timely for 2018. Many regulars will be familiar with my use of godly coincidences as a tool in receiving, checking and testing prophetic words and visions. The scriptural warrant for doing so is quite clear but new readers wishing to investigate further are directed to ‘The Protocol of Prophecies’ in An Introduction to Prophecy. I was pleased to get a confirmation from a pastor that had been the start of a prophetic process for him too. Yet for me it had been a ‘need’ to write on the prophetic. Moreover, I’d been unconscious to a specific thread that had been sewn throughout the years until recently, when another sudden shower of serendipity surrounded me with ‘jigsaw pieces’ – just like snowflakes lying around my feet! This time, it gave me grounds to get out my old files from 2009-10. And this wasn’t the first time buttons had been pressed to open up and relive my visual memory. The first such ‘re-opening’ had come after debating an issue at Prophecy Today in mid-December. A confirmatory word brought by Brett Dewey had plugged so powerfully into one of mine in 2011 when I’d had a very vivid dream relating to Bill Johnson’s prophecy on that 3rd September being a turning point for the Kingdom of God in the UK. Brett’s dream in December 2017 showed that what ‘our’ dreams cover is now at the next stage of active unveiling – God-incidents Validate Three Prophetic Visions refers. The second ‘re-opening’ of my visual memory came last week from Tony Puccio after I’d joked in his second England Ablaze about his ‘spiritual observatory’ in Tucson, Arizona. On Wednesday 3rd he kindly sent me a file with covering note simply saying, ‘Thought this might interest you’ – Wot! – a HUGE understatement! In view of a couple of dreams he’d had about an inevitable change of monarch, I’d already put him in touch with a group of intercessors, who’d kindly supplied some historical prophecies on the royal family. It included a transcript of Liz Evan’s Word for UK. Liz replied, “Fantastic, definitely worth weighing” but I don’t recall seeing a paper version of what she’d shared. However, someone had transcribed it from her ‘Prophecy in the UK’ session at 2010 Release Conference in Bristol with Bill Johnson (him again!) and Mark Stibbe. A copy of that came from Tony, but Liz kindly sent me her version for publication (see previous post). I realised 7 years have elapsed since this Call was made at Release 2010. That evening’s meeting with our curate of Bramshott & Liphook Church discussed her pre-Alpha spirituality course. She will be teaching on ‘interior castles’ (per Carmelite St Teresa of Avilla)!! Our vicar Valentine Inglis-Jones was previously curator at Holy Trinity, Coombe Down Bath, and will be with out there with Paul later this month! So Sunday’s passing remark by pastor John in Daphne, Alabama, makes yet one more confirmatory ‘God-incidence’. On top of all that is what I’d sensed about Windsor Castle in 2011 and shared with Sharon in February 2012. In that month, at a conference in Torquay, I mentioned to Sharon that Nina and I had visited Windsor the previous year and I’d sensed a spiritual atmosphere there. As we spoke, an image of its Castle’s famous round tower came into mind. This was followed by the idea its crenellated battlements look like the teeth of a giant cogwheel, and this could fit into some sort of invisible socket where earth could get plugged into heaven! Also, I’d had the distinct impression of 2018 being a year of going up a level, like in spiraling up after having gone around full circle ie as in a 7-year cycle. 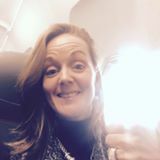 Personally, I wanted to move into the more restful 7th year of this blog’s cycle (as in my New Year thanks) yet have a strong sense of moving into a new level – and most astonished to get an award! A most intriguing closing thought: I’d considered re-publishing my first New Year’s blog Points to Ponder 2011-12 on its 6th anniversary. I didn’t do so yet its subject of Biblical cycles is repeated a couple of paragraphs back – and I sure didn’t plan it that way! Many thanks to all those who have kindly shared Liz’s call to pray for Britain. Is Donald Trump God’s man for this time? Pray for his salvation? Am sure you have your own ‘Yes’ or ‘No’ answer to the above question, but the purpose of this post is so you can read brief correspondence on the issue and learn more about the man. Moreover, as I was about to start writing I was nudged to check progress on a debate at Prophecy Today UK that I’ve been mulling over. I espied a thread by one of its contributors and thank the Lord and John Shipton for drawing attention to something I’d long forgotten. Although I wanted to blog on a couple of other things (! ), I’ve done some unscheduled research on what proves to be essential background data to this important issue. ‘There were unusually a good number of prayers – specifically in Jesus’ name – for him and the nation at his Inauguration, including by Franklin Graham, whom Obama disliked and got ‘disinvited’ from Pentagon prayer breakfasts! The lady who prayed for Trump is said to have led him to the Lord (See this recent Washington Post item She Led Trump To Christ but ignore image!). Read Lance’s full prophecy in Isaiah 45, King Cyrus and Donald Trump (19 January). In addition, we learn that Donald Trump has highly significant godly ancestry! Just days before Trump was inaugurated BBC Songs of Praise from The Hebrides, off-shore from Scotland’s west coast, looked at his maternal ancestry on the Isle of Lewis – see Tongs of Praise… (sic) in The Scottish Sun, 11th January 2017. Next, we’ll read Robin Main’s blog about it >> click to continue reading. A week today 6th December, President Trump declared the United States of America’s recognition of Jerusalem as the capital of Israel and decision to relocate US Embassy from Tel Aviv. The next day John Kilpatrick, senior pastor Church of His Presence in Daphne, Alabama, recorded his thoughts about it being a significant spiritual tipping point setting many things in motion – and set hell off – because it aligns the nation and its president with the Almighty. The church is located on the eastern side of Mobile Bay (named by Spanish ‘Bay of Holy Spirit’: see Bay of Holy Spirit Revival) on Gulf of Mexico’s northern coast with its subtropical climate. So we could say that quip proved to have a prophetic edge! ‘The old record was only a trace amount of snow on December 8, 1942. Local NWS records date back to 1842. Jarrod Cooper: many prophets are prophesying a new era! Daniel 2: 21 states that God “changes times and seasons” while Acts 17:26 says God “determines pre-appointed times”. Amos 3:7 says “Surely the Sovereign LORD does nothing without revealing His plan to His servants the prophets”. As I’ve poured over prophetic words from around the world in recent times I have indeed found a recurring theme that a new era, a new age, a new Church chapter is emerging. In the United States Rev John Kilpatrick, most renowned for a move of revival in the 1990’s stated, “the Lord said, “Tell My people I have brought about a season change”, while Stephen Herzig, from Christ Of The Nations in September 2013 prophesied. “This is a time of ‘new beginnings. What ‘was’ is no more. What ‘will be’ needs new foundations”, signalling that a preparation time for a new era was underway. In 2014 Charles Shamp said under the inspiration of the Holy Spirit, “There’s coming to this country signs and wonders that this country’s never seen before. We’re birthing something that has never been in this country…This nation has seen mighty moves of revival but the LATTER movement of the glory of God THAT IS COMING NOW over this nation is going to trump everything you’ve ever seen in the UK. It’s NOT going to look like the old thing – it’s SOMETHING COMPLETELY BRAND NEW and what it’s going to do is literally even to shake ground in this country…”. Again in 2014 Heidi Baker spoke of a great change emerging out of the United Kingdom, “There’s going to be a movement of unity in the UK that’s going to shake the world,” says the Lord. I hear the prophetic word of the Lord – “it’s another wave of revival He’s promised – This move of God is different than you’ve ever seen before…because no one’s going to point to one mighty evangelist – There’s going to be a move of unity within the Body of Christ…another historical move of God… you are going to come together for the prize…“I will give you souls!”. Over and over again the prophets are speaking of a changing season, a new era, a greater day and the dawning of a new age. In January 2013 the UK Prophetic Council released a word concluding that we are “moving into a historic season to be known as ‘Days of Wonder’ “. This particular phrase is dear to my heart, as in 1996 God gave me a vision of revival, calling it the “Days of Wonder”. I had been flying from London on a flight that appeared to be stopping at every African village en-route to Johannesburg. Sleeping through the night I was wakened by a startling vision of the glory of God. I lay terrified for several minutes, then slipped back into sleep. On arrival in South Africa the visions continued for several nights. Whilst ministering in South Africa God began to move at a level I had seldom seen before. People were healed, saved, drug addicts overwhelmed by the power of God. There were sightings of angels, visions of the future, and whole congregations were taken up into wondrous meetings with God. Backsliders came back to Christ, the oppressed were delivered, the unsaved fell down, overcome by God’s presence and got up saved! It was amazing. All these prophetic words, accompanied by inspiring teaching, historical context and a fresh sense of what God is doing in the earth is in my new book “500: Is a New Era of glory dawning on the earth?” For the book’s full details click here. The following prophetic words brought by Chris Bennett add to the few posted on this blog of many in the public domain about a cleansing fire from the Lord, especially re Capstone Church. In reiterating the ‘wheat and tares’ parable it reinforces a vital theme I’ve written about for the past eight years that’s now coming ‘to the boil’! Chris posted this on Facebook the same day as the astronomical alignment resembling the ‘great sign’ of Rev 12:1. However, he’d surmised that the event isn’t related to the scripture because preceding parts of that book have yet to be fulfilled (eg. chapter 11’s two witnesses). Also, bear in mind pastor John Kilpatrick had a prompting that event may be a breakthrough for other ‘signs’. ‘This follows my recent word about burning up the dross. ‘A long time ago, in 1904, Holy Spirit fire swept through the UK starting in Loughor, South Wales. It was led by one Evan Roberts, and that fire spread throughout the world including a house on Azusa Street, Los Angeles, under the leadership of William J Seymour. Millions came to salvation through these revivals and the off-shoots all around the world, and everyone is now waiting for the same sort of thing happening today. ‘The Lord will bring fire once again to His church and to the world. We know this much already because it’s been prophesied for decades if not centuries. The ‘signs of the times’ that Jesus and later Paul spoke about are almost universally accepted as being upon us. Earthquakes, floods, fires, storms – we’re just missing that few moments of stillness when the ‘still small voice’ of the Lord will be heard. Selah! Let be so Lord! After co-hosting the special celebration of Feast of Trumpets at Church of His Presence over last Friday-Saturday, pastor John Kilpatrick shared his ideas on the significance of the ‘radiant woman’ alignment in the heavens. First, however, he told of a bald-eagle having been on their porch and then circling over and following him whilst driving around the property. “It’s going to be a sign that will open up many other signs – it will be the beginning of many signs. “A great sign (punching his hands) is a sign of a breakthrough that will bring about many other signs. Usually if there’s something big that happens (again punching hands) it punctures through and what’s been clogged up begins to filter through. “Lord, we believe that we’re going to go through a season of restoration, restoration of children, restoration of marriages, restoration of health, restoration of revival. Watch and be blessed by the first five of minutes of the above video for fuller details leading into John’s prophetic insight. Although I don’t agree 100% with John Kilpatrick’s reasons for a pre-Tribulation ‘rapture’ of believers in Jesus Christ, some significant serendipity alerted me to pay very close attention to his latest message entitled Your Redemption Is Drawing Near. I’m amazed to discover upon transcribing some of its video that a particular time-stamp reinforces a personal ‘bridge over the Pond’! (2:11:45) “One thing I can tell you is this: the Lord spoke to me a few weeks ago, two mornings in a row and He said, “The earth is marked for change”. (2:12:00) “I heard it when I was coming out of sleep (pausing to wipe his brow) and the next morning when I was coming out of sleep I heard the very same voice and very same words: “The earth is marked for change”. “It so shook me I called a meeting that night, took my staff out to eat…and I told them at the end of the meal what I just told you – it doesn’t sound serious when I say it, but that’s because you didn’t hear the voice I heard! But whenever the Lord or Holy Spirit tells you that, I wasn’t able to convey it like that. So you can’t tell what I felt – but I know the earth is marked for change. “And that is not just the earth but is also the heavens – and the Holy Spirit has said to me there’s going to be such things begin to happen…it’s going to be so shaking to people before we get out of here, before the Lord comes to get us, there’s going to be so many things that’s going to shake people that, if you’re not forewarned, it’s going to shake you! “I never really put two and two together ’til Friday as I was preparing my message – but because Donald Trump is president and not afraid of anyone he’s saying things most presidents would hold…and we need a president now who says what we need to hear, even if it’s insulting. So when he came out and said about ‘fake news’…yes, I began to realise I’ve been hearing a lot of fake news…There’s no collusion, there’s nothing to it, it’s all just hype..
“They will do the same things about the signs of My Coming – they will NOT report things that need to be reported that will shake the nations about the soon coming of Christ. They’ll hold it and talk about a bunch of nonsense”. We watched that live-streamed service from Church of His Presence in the afternoon. A few hours earlier at the morning service in Liphook, one of our ministers had encouraged us to come forward for a blessing for opening up, or developing, our personal journey and calling in Jesus. After a number of recent indications on how He’s been steering me since a young boy, I gained an insight into my mother’s preference for using my middle name – John. Homing into that, I recalled Apostle John was favoured by leaning upon Jesus’ chest, and subsequently by a visitation from which he recorded ‘the revelation of Jesus Christ’. So I briefly recalled His visitation to me one night in September 1989, as recounted in On a Trapdoor to Hell – Jesus Swoops to the Rescue. YET it wasn’t until today that I discovered a THIRD connection in pastor John’s talk! It’s directly relevant to a personally relevant number referred to in those two earlier posts: 212 – the number of the house I lived in when a boy. AND those preceding links reveal earlier instances of such ‘serendipity’; that is, God-incidents! In listening to the recording of pastor I’m ‘God-smacked’ by the indisputable fact that only when the recording has been playing for 2 hours 12 minutes does he start telling how he got warned upon awaking from sleep!! Hmm, so we have something significant to contemplate and wait upon with the Lord -and those personal markers are telling me to pay attention because they validate His word to pastor Kilpatrick. How about you, my reader, what do you think? Two major prophetic words relating to North Korea; updated 2018 with more. The current convergence of biblical and historical cycles is coming to a head and, leading into my brief update on this, we need to be aware of how a couple of recent prophetical words mesh into the bigger picture. They come from a pastor and a preacher whom the Lord anoints with prophetic unction as and when necessary for instructing the Church (1 Cor 12:4-11). “…The thing that will mark this move of My Spirit to distinguish it from all others is that I am going to move mightily in closed nations and closed societies. The word of spiritual bread among these starving and closed nations will create spiritual refugees, which will immediately create movement of entire nations of hungry and spiritually starving refugees toward the outstations of fresh bread. experience My mercy just as Naomi arose and brought her daughter-in-law, Ruth, to the place of visitation. It was there that Ruth was joined with Boaz, her redeemer. “I tell you, many will believe this good news to be a rumor, but they will continue to hear the reports until they will come and see for themselves the wonders of the Lord. It will cause a great stir among the nations. I am going to unseat powers and principalities in those regions that have long deprived the people of My presence and of My Spirit. A brief, but widespread harvest will occur. A once closed society of unbelievers will now have the opportunity to hear and to believe upon the Lord Jesus. them during this harvest. There will be great excitement! In March 2014 I blogged about Charles Shamp foretelling a spiritual awakening in Britain and later we looked again at this, and then on what he foresaw in mid-2015 of a renewed spiritual bonding between the UK and the USA; The Lion Has Roared and The Eagle Will Fly. It’s time to pray for North Korea! Ignite Ireland Ministry, news on developments between North & South Korea.